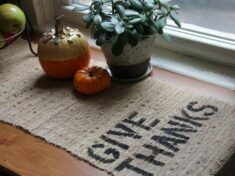 Get all the supplies for this project in a DIY Kit HERE! Using a piece of cardboard, measure out 3 squares that are 4″ x 4″ and inter-connected by a triangle that is 4″ x 4″ x 4″. Once this is complete, cover all cardboard with duct tape completely. Once the mold is completely built, it’s time to mix the cement. In a bowl, mix water and cement (follow the directions on the packaging). Play around with the measurements until you get a puddy like texture. Once your cement is mixed, pour it into the mold. Next, wait for the cement to harden for 7 minutes and then place the plastic egg in the cement to make your imprint. Watch out, as the cement hardens quickly! Allow your cement to set for 10 more minutes or until the cement has completely hardened, then peel off the mold. Finally it is time to add some color. 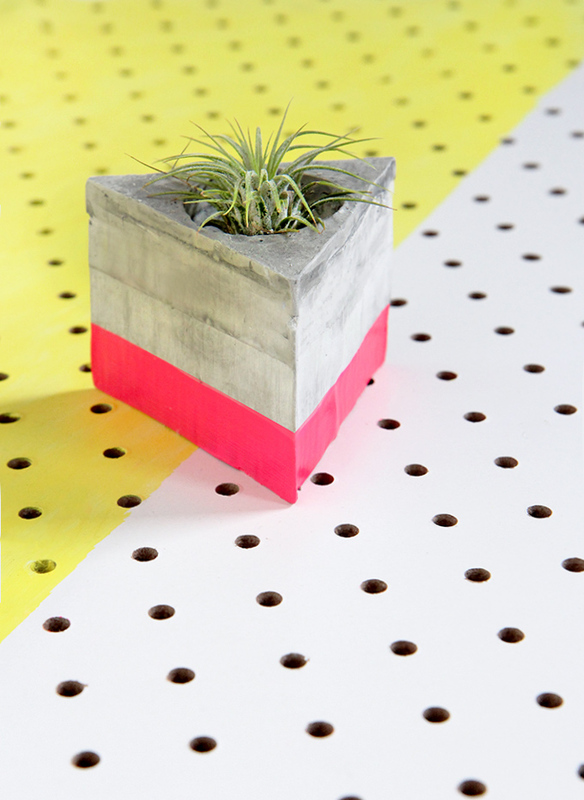 With your foam brush, add a generous coat of paint to brighten up the planter. 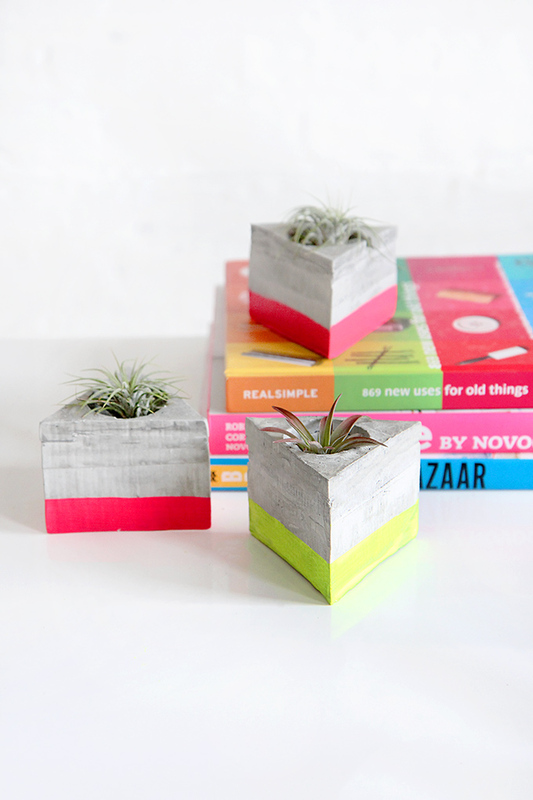 Allow the paint to dry for 30 minutes before adding your air plant. 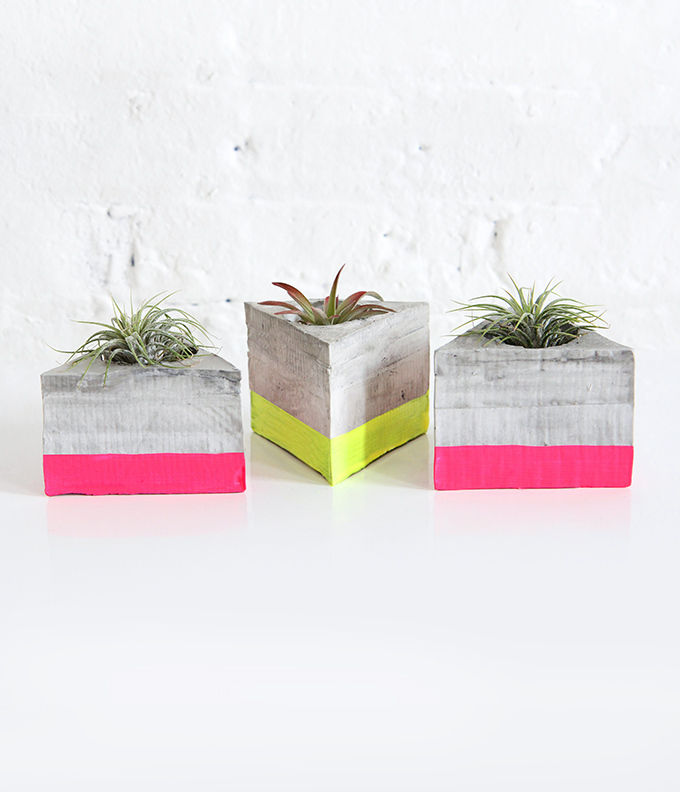 Airplant care: Place in light but not direct sunlight. 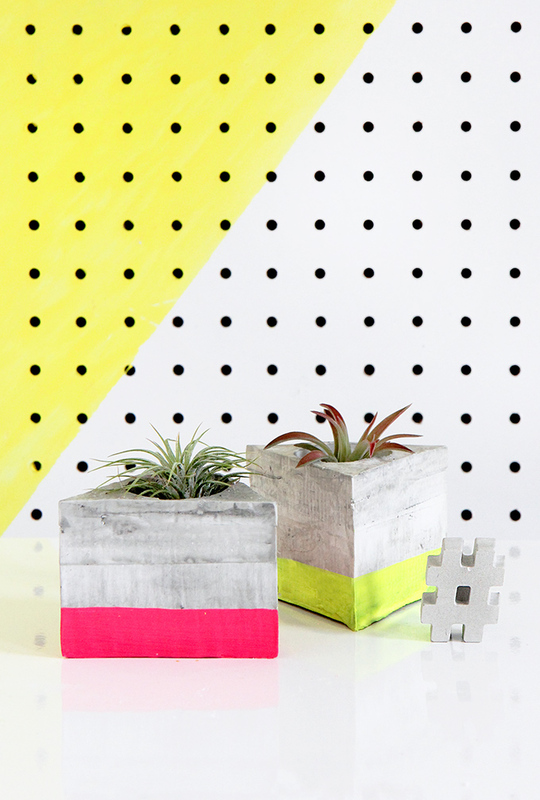 To water your air plants, spritz with water every 2-3 days. 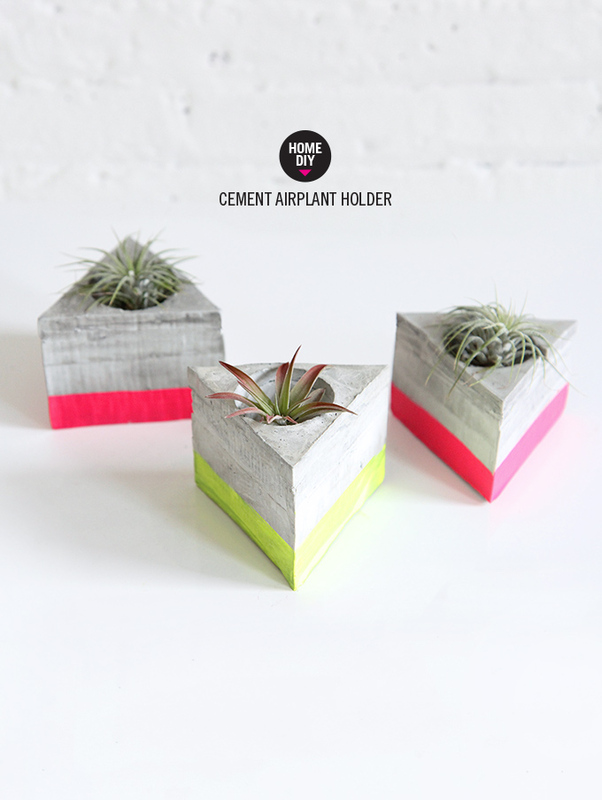 I love cement crafts, haven’t done it myself but these planters are awesome! Will definitely try that! What an adorable and creative way to brighten one’s office space or even nursery! 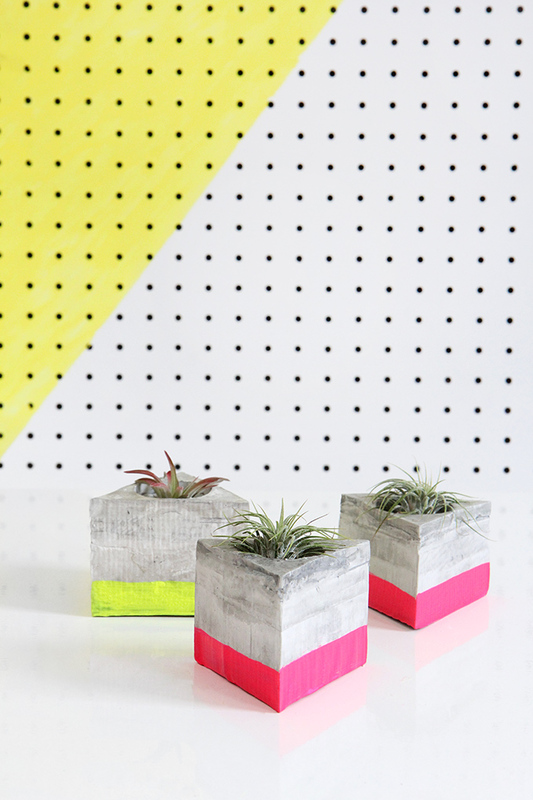 We love the balance of grey and industrial cement and the neon paint.. Would love to make one of these airplant holders for the little peach 🙂 And by the way, these photos are amazing! Nice ! I love the idea and specially the triangular shape, well done ! 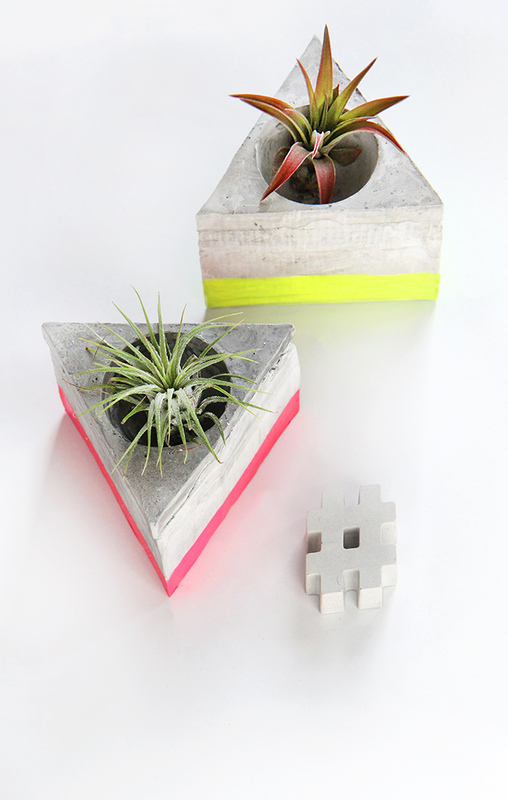 I LOVE the look of concrete and this would make such an amazing addition to my desk. Im totally pinning this so I can attempt to make it later! 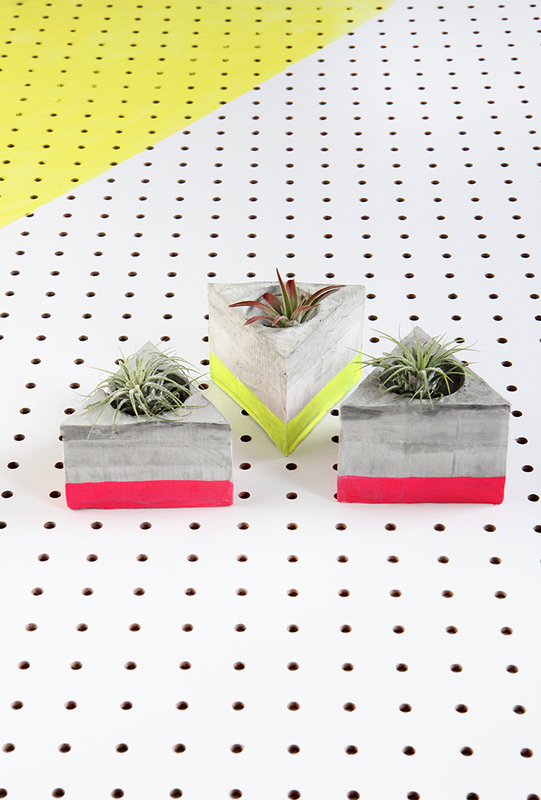 Airplants don’t to be planted…planted, Mom! These are so stinking cute! 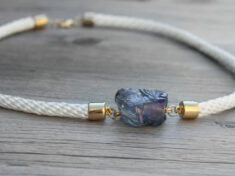 I love the bright colors, absolutely perfect for spring! This is amazing. End of.